You Care about your health and what you're putting IN your body. but what are you putting on your body? A piece of the puzzle most women are missing that could make or break your health. The Last Year the Federal Government passed a law to regulate cosmetics was in 1938? The European Union Bans 1300 known chemicals and carcinogens from being used in their products. There have been over 80,000 chemicals introduced into our market place since WWII, less than 10% of them have EVER been tested for safety and most of them are in personal care products and makeup. Hey There, my name is Cat. I’m guessing safer beauty is not what originally brought you to my website today. I’m primarily a fitness coach and my passion is health, fitness and overall wellness. replacing everything in my bathroom to cleaner products. I was that person dumping everything in the trash can and starting anew. But then I ran into a problem. Then, about 2 years ago, I was introduced to a company doing things differently. They wanted to make makeup and skin care safe by stricter standards, but still maintain the beautiful branding, packaging, and high performance we all love to “ooh and ahh” over. Products are a personal logo. We, women, are very picky when it comes to our products. ingredients being used and what women know about it. There are more than 80,000 chemicals on the market. With more being introduced every single day. And the reality is most of these chemicals have never been tested for safety. These are among the 16 products women are using on a daily basis. A self regulated multi Billion dollar industry. And you're the guinea pig. used in personal care products since 1938 (pre WWII when none of these chemicals existed). The European Union bans 1400 ingredients and Health Canada is up to 600.
when it comes to chemicals being used in products? partner and advocate for is Beautycounter. I have yet to find products comparable to their standards for safety and performance. Health Canada and their own personal research findings to formulate their “Never List” of products. new standard for bathroom counters all across the country. revamping your bathroom counter, what do you start with? Transitioning to safer products should be fun, easy, and exciting. I’ve put together some of my favorite products and sets for easy, simple ordering. Many scientists agree skin care and moisturizers are among the first things to begin switching over once moving towards safer products. 65% of the ingredients are absorbed directly into our bloodstream. This is set is my personal favorite and comes with a Cleanser, Toner Pads, Serum, and Day Cream. 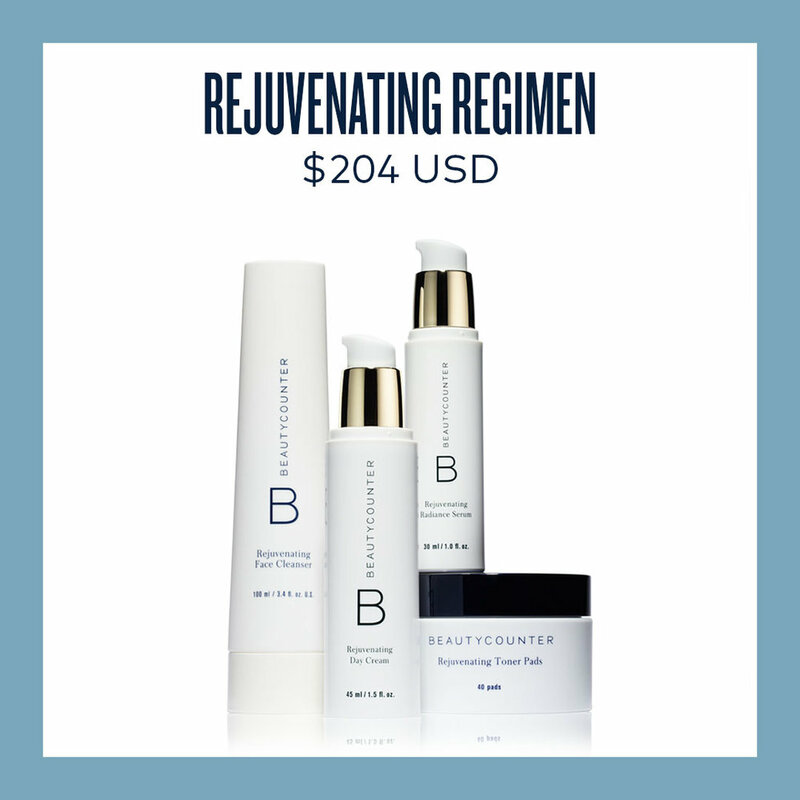 Plus, purchase this set and receive a free product of choice from a Charcoal mask, Overnight Peel, or Cleansing balm. Get the top selling must have makeup products in the colors of your choice. And save $37. These are absolutely the best products to get started with if you want to start cleaning up your make up. Heavy metals are abundant in most make up. At Beautycounter, we third party test all the final products for trace to 0 amount of heavy metals. Who’s the young girl in your life? The CounterControl Collection was created with acne prone or teen skin in mind. Growing reproductive systems don’t need a bunch of chemicals messing with their hormones. Formulated safe and without all the typical chemicals in acne products. Safety and performance in one set. Want more info on specials, promotions, and how you can easily switch to a safer lifestyle? I'll get you started with the top 16 ingredients you should trash immediately and provide safer replacements you can buy or make yourself. Thank you! You’re list and safer beauty is on the way! In 4 weeks or less, you can have a totally different appearance and the confidence you yearn for. In this 4 week online course, you'll learn what could be causing your "problem skin". Beauty comes from the inside out. But most often what we're eating and the products we're using shows up externally. Join the list above and you'll be the first to know when this launches and be offered an Introductory Price.